VideoRay's Mission Specialist utilizes Greensea technology for its Control Software. The Flight View display is the default Greensea Workspace display. It can be accessed by clicking the Greensea icon from the Navigation Bar. 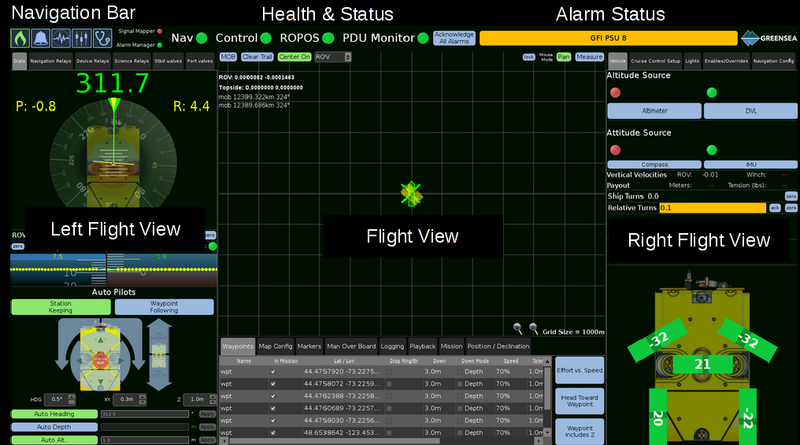 All the necessary tools for monitoring the ROV are located on the Flight View. The Flight View is divided into three views: the left flight view, the flight view and the right flight view. The Device Diagnostics page, accessed by clicking the stethoscope icon, allows the operator to monitor navigational and operational data in real time. The Device Diagnostics page groups data by both device and function so that operators have an effective tool for easily understanding the health and status of the vehicle and vehicle subsystems. The Device Diagnostics page features two tabs: Vehicle Sensors and Vehicle Configuration. The compass rose displays the vehicle's instantaneous heading, pitch (P), and roll (R). A yellow breadcrumb trail shows the vehicle's heading history. If the vehicle is following an Auto Heading set point, the heading will display in green text and a green pointer will appear. If the red "COMMS" message appears, there is a problem determining the vehicle attitude. Right-clicking the compass rose provides a selection of compass rose settings including: the option to display the ship, choose between north-up and vehicle-up orientations, and speed up or slow down the breadcrumb trail. The depth and altitude gauges are positioned below the compass rose. They display the vehicle's current altitude relative to the sea floor and the depth in meters. The Balefire Workspace contains several autopilot functions that enable precise and accurate autopilot control over the vehicle. The autopilot functions can be used concurrently and can be used to fully automate vehicle motion, or to control the vehicle in fly-by-wire mode. The Cam tab shows the tilt of the camera and enables the operator to take a photo by clicking the Take Snapshot button. The video HUD displays the vehicle's video feed. Additionally, the basic functions needed for navigation and control are included on the video HUD. The annotated image and accompanying table outline the overlay's functionality. Alarms are displayed across the top of the video HUD. The vehicle's compass heading is shown at top dead center of the overlay. Pitch and Roll are displayed in yellow as they are on the main workspace screen. The vehicle's depth is displayed in the top left corner of the overlay in yellow. The color of the depth reading will change to green and "set: 0.1" will appear when Auto Depth functionality is enabled. The vehicle's depth is displayed in the top right corner of the overlay in yellow. The color of the altitude reading will change to green and "set: 0.1" will appear when "Auto Altitude" function is enabled. The vehicle's vertical velocity is displayed on the sliding indicator at right. The date and time are displayed in the bottom left corner of the overlay. A vectored chart of the vehicle's axial and lateral velocity is shown in the bottom right corner of the overlay.